Check out Carle's color options below. The Carle Bag from Petote is a brand new addition to our collection of airline approved pet carriers and dog bags. The Carle bag is manufactured by Petote right here in Chicago! Made of durable black ballistic nylon fabric. 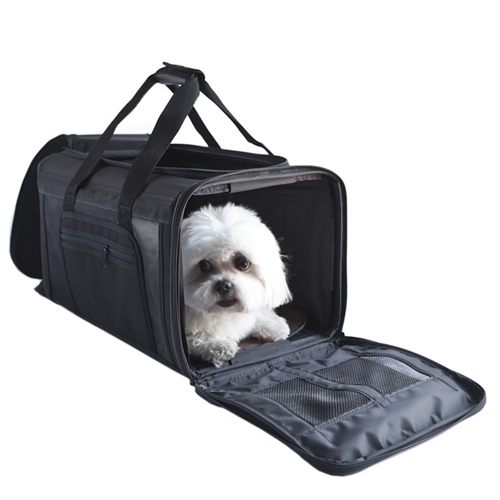 The Carle Bag is a great bag for transporting your dog or cat. The Carle Bag features lots of ventilation and easy entrance from top or sides. The Carle bag is airline approved for most carriers. Accomodates dogs or cats up to 15 lbs. Check out Carle's color options.